The name "Daihatsu" is a combination of the first kanji for Ōsaka (大) and the first of the word "engine manufacture" (発動機製造, hatsudōki seizō). In the new combination the reading of the "大" is changed from "ō" to "dai", giving "dai hatsu". 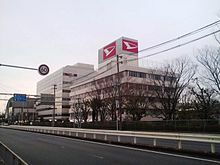 Daihatsu was formed in 1951 as a successor to Hatsudoki Seizo Co. Ltd, founded in 1907, as part of Hatsudoki's major restructure. Hatsudoki's formation was largely influenced by the Engineering Department's faculty of Osaka University, to develop a gasoline-powered engine for small, stationary power plants. From the beginning of the company until 1930, when a prototype three-wheeler truck was considered and proposed, Hatsudoki's focus was largely steam engines for Japanese National Railways and included rail carriages for passenger transportation. The company then focused on railroad diesel engines, working with Niigata Engineering, and Shinko Engineering Co., Ltd. Before the company began to manufacture automobiles, their primary Japanese competitor was Yanmar for diesel engines that weren't installed in a commercial truck to provide motivation. During the 1960s, Daihatsu began exporting its range to Europe, where it did not have major sales success until well into the 1980s. In Japan, many of Daihatsu's models are also known as kei jidōsha (or kei cars). Daihatsu was an independent auto maker until Toyota became a major shareholder in 1967 as the Japanese government intended to open up the domestic market. According to Toyota, it was first approached by Sanwa Bank, banker of Daihatsu. In 1995, Toyota increased its shareholding in the Company from 16.8 percent to 33.4 percent by acquiring shares from other shareholders: banks and insurance companies. At the time, the Company was producing mini-vehicles and some small cars under contract for Toyota. Toyota, by owning more than a one-third stake, would be able to veto shareholder resolutions at the annual meeting. In 1998, Toyota increase its holding in the Company to 51.2 percent by purchasing shares from its major shareholders including financial institutions. In January 2011, Daihatsu announced that it would pull out of Europe by 2013, citing the persistently strong yen, which makes it difficult for the company to make a profit from its export business. Following the financial crisis Daihatsu's sales in Europe plummeted, from 58,000 in 2007 to 12,000 in 2011. In August 2016, Daihatsu became a wholly owned subsidiary of Toyota Motor Corporation. 1963 – Introduces the Daihatsu Compagno which utilized multiple bodystyles on one platform. 1971 – First generation of the Daihatsu Delta Truck model launched in Japan, a Toyota influenced four wheeled six ton cargo lorry. 1975 – Begins to supply diesel engines to the SEMAL company of Portugal for the new PORTARO 4X4 offroad vehicle series. 1998 – Toyota gains a controlling interest (51.2%) in Daihatsu Motor Co., Ltd.
Daihatsu's first export was in 1953, and by 1980 half a million Daihatsu vehicles had been exported. Since the late 1990s, its exports have been steadily contracting. This has been partially offset by the sale of Daihatsu vehicles through the Toyota channel, and the sale of technology to Malaysia's Perodua. Following the 1997 Asian financial crisis, Daihatsu closed their plants in Thailand and withdrew from the market entirely. Until withdrawing in March 1998 they had mostly been selling the Mira range in Thailand, with certain local modifications. It was reported on 31 March 2005 that Toyota would withdraw Daihatsu from the Australian market after sales fell heavily in 2005, in spite of the overall new-car market in Australia growing 7%. Daihatsu ended its Australian operations in March 2006 after almost 40 years there. Daihatsu's operations in Chile, where Daihatsu is well known for its 1970s models such as the Charade or Cuore, were also threatened after low sales in 2004 and 2005. Toyota has stated that it intends to persist in the Chilean market for now, where only the Terios model is available. In Trinidad and Tobago, Daihatsu has had a market presence since 1958 when its Mark I Midget was a popular choice among market tradesmen. From 1978 until 2001, a local dealer marketed the Charmant, Rocky, Fourtrak, and then later, the Terios and Grand Move which were popular. The Delta chassis remained popular from its introduction in 1985 until today. Toyota Trinidad and Tobago Ltd. (a wholly owned subsidiary of Toyota Japan) now markets Daihatsu Terios, YRV and Sirion under stiff competition. Daihatsu announced on 13 January 2011 that sales of Daihatsu motor cars would cease across Europe on 31 January 2013. This was due to the increasing strength of the Japanese yen, which has increased prices beyond competitive levels. Daihatsu states that there is no stock of new Daihatsu cars in the UK, and they do not expect to import any cars in this interim period. Toyota New Zealand announced on 8 April 2013 that sales of new Daihatsu vehicles in the country would cease by the end of the year, citing a lack of products that would comply with future NZ regulatory standards. No additional new vehicles were being imported as of the announcement date. In April 2015, Daihatsu pulled out of South Africa. Daihatsu has also supplied cars under different badges to various automakers in the past. The company currently provides engines and transmissions to Malaysia's Perodua, which manufactures and markets rebadged Daihatsu cars locally, and sells a small number of Perodua cars in the United Kingdom. After the launch of Perodua, Daihatsu's Malaysian operations were scaled down to concentrate exclusively on the commercial vehicles market, selling its Delta and Gran Max commercial truck chassis; Daihatsu had formerly sold Charades and Miras in the country since it first began operations in Malaysia as a joint venture in 1980. 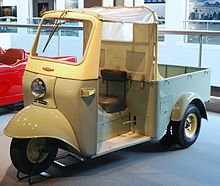 Daihatsu has had a long-running development program for electric vehicles, beginning with the production of "pavilion cars" for the 1970 Osaka World Expo and continuing with the production of golf carts and vehicles for institutional use, such as the DBC-1. An electric version of the company's Fellow Max kei car also followed, the beginning of a series of prototypes. The 1973 oil crisis provided further impetus and at the 20th Tokyo Motor Show (1973) Daihatsu displayed a 550 W electric trike (TR-503E), the BCX-III electric car prototype and daihatsu's own EV1 . Daihatsu showed more prototypes through the 1970s, for instance at the 1979 Sydney Motor Show, and then joined the Japanese Electric Vehicle Association's PREET program (Public Rent and Electronic Towncar) with an electric version of the Max Cuore keicar. The program allowed registered users access to the cars with a magnetized card and charged according to mileage used. In November 1974, Daihatsu released the 'Hallo'(ES38V), a tilting trike powered by an electric motor and two 12V batteries. In December 2011, Daihatsu released the Pico EV Concept, a Quadricycle powered by an electric Motor. The current hybrid vehicle technology is called Daihatsu Mild Hybrid System, and is mainly used in the Hijet/Atrai Hybrid-IV. Alongside the electric version of the tilting trike 'Hallo', Daihatsu also released a petrol powered version using a 50cc two stroke engine. Wikimedia Commons has media related to Daihatsu. ^ "Corporate Info Archived 2010-01-27 at the Wayback Machine." Daihatsu. Retrieved on February 5, 2010. ^ a b c d Pollack, Andrew (Sep 21, 1995). "Toyota Doubles Its Holdings in Daihatsu Motor of Japan". The New York Times. Retrieved 27 December 2016. ^ "Alliance with Daihatsu Motor". Toyota-global.com. Toyota. Retrieved 27 December 2016. ^ "Toyota to take over Daihatsu Motor". The Japan Times. Aug 28, 1998. Retrieved 27 December 2016. ^ "New Vehicle Registrations – By Manufacturer (2011)." ACEA. Retrieved on March 8, 2012. ^ "Toyota Plans Low-Cost Car for Traffic-Choked Indonesia". The Jakarta Globe. Archived from the original on 2011-08-29. Retrieved 2011-08-21. ^ "Kontan Online – Daihatsu plans to spend Rp 2.1 trillion on new factory". English.kontan.co.id. 2011-02-23. Archived from the original on 2012-07-08. Retrieved 2011-08-21. ^ "Toyota completes full takeover of Daihatsu". The Japan Times. Retrieved 2016-08-01. ^ "Daihatsu UK". Daihatsu.co.uk. 2011-01-13. Retrieved 2011-08-21. ^ "Daihatsu Pulls Out of South Africa". cars.co.za. ^ Kobori, Kazunori (2007). ダイハツ 日本最古の発動機メーカーの変遷 [Daihatsu: The History of Japan's Oldest Engine Company] (in Japanese). Tokyo: Miki Press. p. 56. ISBN 978-4-89522-505-2. ^ "Daihatsu History". Daihatsu.com. 2013-02-27. Archived from the original on 2013-07-08. Retrieved 2013-02-27.